You might be surprised to see how Gunpla was first marketed to Americans. Dustin knows first-hand. Dive into a first-person account of what it was like to be a Gunpla builder in the ’00s. March 6th, 2000 was the day that changed everything for anime fans in America. It was the birthday of what became a new form of American fandom. After weeks of promotion through magazines, Toonami promos, and posters at local retail stores, anime fans everywhere were geared up for their first-ever taste of Gundam on Cartoon Network. Gundam Wing hit the airwaves and forever converted thousands of people like myself into die-hard Gundam fanatics. This was also the first time that Bandai experimented with making money off of their new American fanbase. They sold the same kind of merch that worked in Japan when the original Mobile Suit Gundam series aired in 1979: Gunpla, or Gundam model kits. Days after the show aired, retail chains were stocking Gundam models somewhere between WWF and Pokemon amidst the chaotic wasteland of their toy aisles. Bandai wanted to make sure Gundam model kits would fly off the shelves. Their formula: take a Japanese product like Gunpla and turn it into a somewhat macho, extreme sports style pastime that was distinctively cool and undoubtedly American. They missed the mark of “cool” and landed somewhere between “kitschy” and “weird.” Years later, the way Gunpla was marketed in America is more memorable than the kits themselves! Bandai pulled out all the stops to target youthful consumers, with ads featuring burnt down buildings to show how EXTREME your late night model building could be. One wrong move and you’re facing a “no-holds-barred” plastic deathmatch of the century. “Careful where you build them,” the wording went, as if your dangerous new Gunpla kit was about to test your family’s homeowner insurance. But it got even wilder than that. Even though the Gundam Wing kits of the ‘00s were way worse quality than Gunpla today, commercials practically salivated over their supposed attention to detail. Television spots on Cartoon Network illustrated the alleged greatness of those no-grade Gundam Wing kits using Warhammer 40k dioramas and smoke machines to really sell how badass these kits were. This is the commercial most Gundam fans remember from the ’00s. Newer fans might be surprised to see that this is not a joke, this is really how Gundam model kits were first promoted in America! It was a simpler time, mind you, but I can’t laugh at it too much because, even with these silly commercials, it was how I got into Gunpla in the first place. So what was it like to pick up a ‘00s Gundam model kit from store shelves? First, you had to find the rectangular looking cardboard boxes that read “Action Figure Model Kit” somewhere next to the giant red “GUNDAM” lettering featuring a robot-like figure. 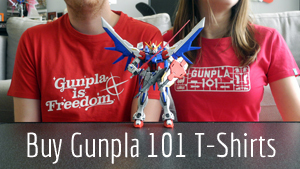 I don’t believe I heard the term “Gunpla” until years after I got into Gundam. Retailers wanted to make it as simple as possible for the general non-nerd consumer to pick one of these kits up for their children. These kits came with a very simple system that ranked kits from easy to challenging depending on the number of parts they came with. This is where the “Skill Level” recommendation tag comes into play, since the more pieces a kit has, the higher the skill level the kit was. These range from 1 to 10, with 10 ranging in the Perfect Grade category (though I never saw a PG ever sold on store shelves). A “level 3” model kit, or about the equivalent of a High Grade today. At the time, kits came with two manuals: in English and Japanese. Gunpla builders today get just one manual with a lot of pictures—so you don’t need to know Japanese to build. At the time though, it was thought Americans needed their own instructions in order to get started. However, only the basics made it into the English instructions. If you wanted to know more about dioramas or paint colors, you were out of luck. Interestingly, the stickers are also in English characters. So you’d use sticker A instead of sticker あ, for example. It’s just matching, so it’s easy to see why this is no longer done. One of the things you would find included in ‘00s kits were promotional pamphlets for upcoming toys and models, and a registration form to register yourself for the “Earn Your Rank” promotion to get Gundam Wing pins and be recognized for your hard work in buying Gunpla. As far as I know, these kits were sold until roughly 2005 or 2006, since that was the last time I remember roughly still seeing American kits on the shelves at Toys R Us primarily. And good riddance to them. According to the Animerica “Gundam Official Guide” book that came out in 2002, the writers had choice words to describe these kits compared to High Grade models coming out in Japan at the same time. As long as Americans didn’t know any better, the quality of the kits didn’t matter. Today, Bandai distributes Gunpla in the US through one official source: Bluefin. You can find high-quality Gunpla at Barnes and Noble bookstores, hobby shops, anime stores, and the internet. And ever since 2016, you can buy Gunpla, once again, at Toys R Us. After all these years, I’m still reminded of how excited I was to get my first Wing Gundam model from Toys R Us, and it puts a tear to my eye to think about the look of excitement on a fan’s face when they’re getting their first kit there, too. About Dustin: I’ve been a long time Gundam fan since Gundam Wing aired in March of 2000. I collect whatever Gundam merchandise I can get my hands on that’s been released in the states, including every English Gundam game released. I’m a podcast co-host and blogger at the Anime of Yesteryear Podcast, convention panelist, digital media specialist, videographer, writer for online websites, and a purveyor of the unique and the odd in anime. I’m also an expert Initial D Arcade Stage player with my own arcade cabs.